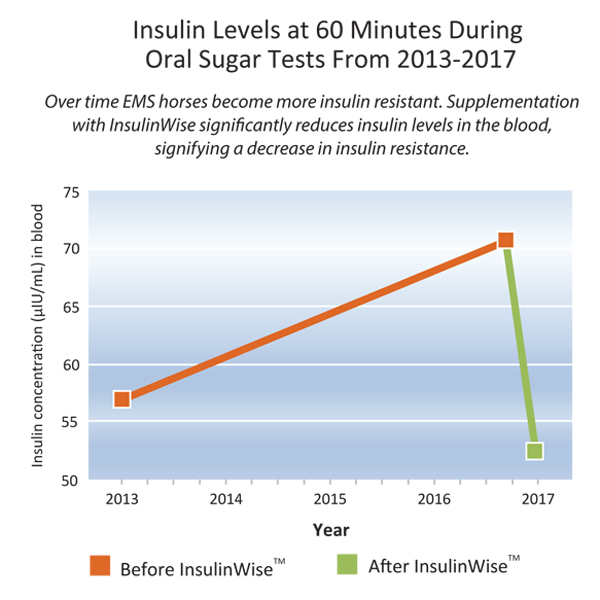 Support a decrease in insulin resistance in horses with equine metabolic syndrome (EMS) and/or pituitary pars intermedia dysfunction (PPID) aka Cushing’s disease. 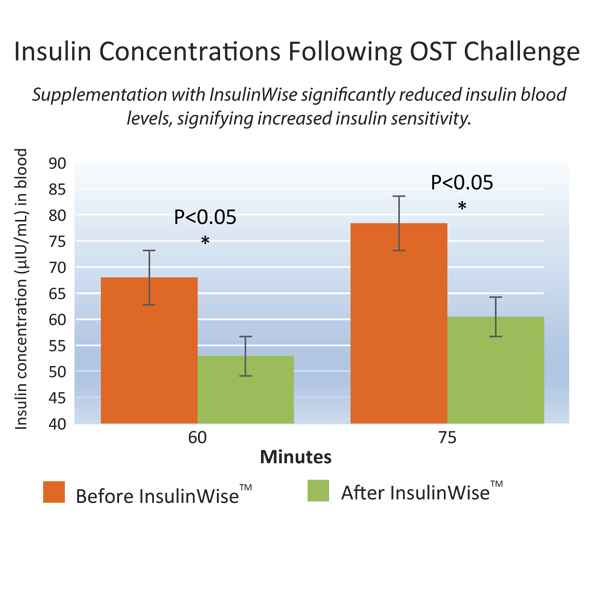 InsulinWise is available only through a licensed veterinarian. Contact your vet for an ordering code today. Equine metabolic syndrome (EMS) and pituitary pars intermedia dysfunction (PPID) have become more and more prevalent in our aging equine community. EMS is characterized by weight gain and insulin dysregulation that can lead to the development of laminitis. Horses that have developed PPID (Cushing’s disease) may also suffer from insulin resistance. Decreasing insulin resistance and controlling weight through dietary supplementation in these individuals can provide a benefit by decreasing laminitis risk. This synergistic blend of polyphenols and amino acids, including leucine, support normal insulin regulation in horses showing symptoms of equine metabolic syndrome (EMS) or PPID horses exhibiting insulin resistance. 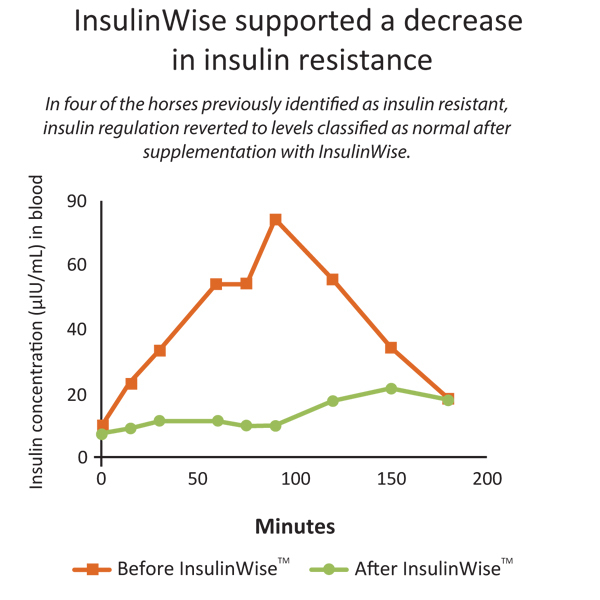 The propriety blend of ingredients in InsulinWise are research-proven to support lower insulin levels and increased adiponectin concentrations in horses suffering from insulin dysregulation. Maintaining normal levels of these hormones and decreasing insulin resistance can provide a clinical benefit by decreasing the risk of laminitis. * Manfredi JM, Stapley ED, Nash D. Effects of a dietary supplement on insulin and adipokine concentrations in equine metabolic syndrome/insulin dysregulation. in Proceedings Am Assoc Equine Pract 2018; 64:473. For all classes of horses and ponies, supplement at a rate of one scoop (28 grams) per day. The amount provided can be split between a.m. and p.m. feedings by offering ½ scoop (14 grams) at each feeding. For best results, mix into meal at time of feeding. Exposure to air for extended periods of time will impact potency. Seal container tightly after each use. If mixing in with meals in advance of feeding, store in an airtight container. Store InsulinWise in a cool, dry place. Reseal lid during storage. Shelf life is 24 months from date of manufacture when stored under suitable conditions.